We arrive in Nova Scotia with no further complications and make an appointment at the hospital on the South Shore where we will give birth. They need to do a series of tests in order to begin monitoring both us and the babies. Because this is a whole new world for us, we decide to take the optional tour that is run for couples expecting their first child. The head nurse shows us around the facility. We tour an observation room, a birthing room and a recovery room while she talks us through some possible scenarios of how our birth experience could run. We are taking this tour with four other couples, and as we enter the birthing room, the nurse indicates some stools and chairs where we are to sit while she answers any questions we might have. Large padded chairs are grouped in pairs with utilitarian wooden stools. The nurse, indicating our swollen bellies, says she’s pretty sure the pregnant women need the comfortable chairs. The fathers-to-be head for the stools. The problem comes when we head for our set of chairs. Viviën is definitely showing and obviously pregnant but is still trying to be tough. She says she’s fine with a stool. She’s only six months pregnant, after all. She waves me toward the comfy chair. One of the fathers-to-be jumps up and darts into the corridor. He comes back with a padded chair and puts it in the place of Viviën’s stool. It is a little gesture, yet one that goes a great distance toward making us feel at home. I give him a smile as Viviën settles in, and the nurse begins talking us through what to expect when we come in to have our babies. She explains that we should come to the hospital either when our water breaks or our contractions are five minutes apart. Then we will be put on the monitor for observation. Every woman’s labour is different, she stresses, and the hospital tries hard to accommodate different kinds of births. There are cots available that can be wheeled into the room so that our partner can stay over during the birth process. When we are determined to be in active labour, we will be given a birthing room, but we are free to walk the halls, take a bath, use the birthing ball or the mats and do whatever our bodies tell us. This hospital appears to be remarkably forward thinking compared to some that I read about. The nurse handles a few more practical questions before she gets to the juicy part: pain relief. I can feel all the pregnant women around the circle shift forward in their chairs. No matter what our views on this subject might be, no matter what kind of birth we hope to have, we all want to hear what she has to say next. The nurse says there are methods of pain relief that work independently and also in conjunction with one another to assist women during the process. Of course breathing, relaxation, movement and bathing are all helpful. If those methods aren’t enough, you can request an intramuscular injection of a painkiller such as diamorphine or pethidine, but this must be given early in the labour. If it is too close to delivery, it might slow down the baby’s breathing. During the first stages of labour they use a numerical scale to notate the dilation of the uterus. In preparation for birth a woman must go from zero to ten, ten being fully dilated. This process, says the nurse, can be quite painful for some women, while others might only feel a kind of pressure. Once you are in labour, you can request a mask that is connected to a tank of nitrous oxide and oxygen. When you breathe in this gas, it can reduce pain but can also make you feel light-headed and sometimes nauseous. She hauls out the tank and mask to show us what it looks like. I glance sideways at Viviën to gage her thoughts at this point and notice that she looks woozy. She has low blood pressure, and sometimes if she is ill, or distressed, or even if she sees blood or a needle, she faints. I recognize the twirling dark look in her pupils and lean over to ask her if she is okay. “Of course the heaviest form of pain relief is the epidural. This is a needle in the back …” Suddenly the nurse jumps forward in alarm. Just as I am whispering in Viviën’s ear, she faints and is sliding down in her chair. Another pregnant woman and I grab her elbows and help her slide safely to the floor. She has told me this is a terrifying experience for her—she hates the feeling of losing control of her body. So, after helping her to the floor, I talk to her, stroking her back and then her cheek for a few moments until she starts to come around again. My only concern is that Viviën gets through the spell as calmly as possible. But the fathers-to-be, the other pregnant women and even the nurse are all pale with shock. One of the guys offers up his coat as a pillow for her head. It gives me a stab of panic to see Viviën’s strong body go down this way. Especially when I feel so vulnerable myself. There have only been a couple times when I’ve questioned the wisdom of what we’ve done, never the pregnancies themselves, but the timing. Maybe we shouldn’t have tried to get pregnant at the same time. Maybe I should have just supported her through this. Am I an idiot? What if I can’t get her to the hospital? Doesn’t the husband have to drive at Mach 2 through a blinding snowstorm to get his beloved wife to the hospital? Carry her into the emergency room in his arms in the nick of time…. Wait, that’s Hollywood. The unfortunate thing about living in an age so saturated with cinematic images is that they can frequently pull a bait-and-switch on you for the circumstances of your real life. We aren’t the Hollywood version of a family. I couldn’t carry my woman over the threshold like the hero of the story even if we weren’t both pregnant! But just like anyone in love, I would do anything, I mean anything, in the world for her. Whatever we have to do for each other, we’ve always found the strength for, and this won’t be any different. Natalie Meisner is a writer from Lockeport, Nova Scotia. Her plays have won numerous awards and have been produced across the country, collected in book form and published in many Canadian anthologies. She is currently an assistant professor of English at Mount Royal University in Calgary where she teaches creative writing, drama and literature. 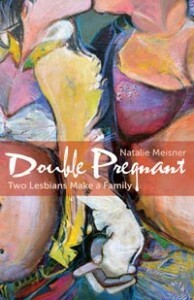 Her book Double Pregnant will be published by Roseway/Fernwood in 2014.